Home > Comment and Features > Dumpster Diving: What do the Supermarkets say? This is the second article of the two-part series on dumpster diving. You can read part one here. Supermarkets consider that eating food from garbage containers is not a wise practice. What is more, they say it risky and warn of potential dangers. For instance, Dansk Supermarked says in its internal policy document: “it is very risky to eat food from garbage containers. There may be many reasons for food being thrown out. For example, there is food that is required by the authorities to be removed from stores after the discovery of bacteria or something else that makes the product unfit for human consumption”. Alexander lives in Denmark and considers dumpster diving as an out-of-line behaviour. “If I worked at a place where they can do it, I wouldn’t feel like stealing. But it is not respectful for our work and the rest of the customers. I think it is a little greedy”, he says. He does not like to waste food either, and suggests an alternative: “every morning I collect all the food and vegetables (that are not going to be sold) and I leave them on the ground until they are collected. A man comes every day and we argue a price for the food he wants to get. For instance, I sell him a pineapple (that cost 1.87 euro) for 0.13 euro. He feels happy and I can earn that money, saving the fruit from being wasted”. This practice is only allowed for food and vegetables at that supermarket. In words of Heilns, food manager from Føtex “we have to be responsible for our customer’s health when they consume our products it has to be a quality product. I get why people do that because a lot of things are so expensive, we try to make things cheap enough so people can do their shopping here. If people want to go dumpster diving, well, good luck, it’s their own responsibility”. Dumpster diving sounds like all of us could have free food and save our conscience regarding food waste at the same time. It is a two-for-one special. But finding daily meals in the garbage may not be easy and might require breaking cultural and social barriers and stigmas. Every country has millions of tons of waste every year, but the idea of dumpster diving is not really accepted. In Spain, for instance, this activity is illegal and the fee for dumpster diving is 750 euros. For Jessica Aschemann-Witzel associate professor at Aarhus University, the topic, might not pop up that much in the public discussion in countries that are not so wealthy, just for a simple reason: “People throw less food out, and these people are more likely looking for food due to poverty or hunger and might not be interested in raising attention towards what they do”. 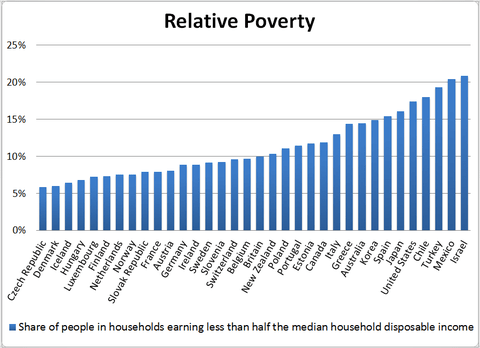 Denmark has the second lowest relative poverty rate in the OECD, below the average of 11.3%. The share of the population reporting that they feel that they cannot afford to buy sufficient food in Denmark is less than half of the OECD average. Besides, insecurity is not a big issue. To walk on the streets in the middle of the night is not dangerous either. Nobody would say anything if they see that someone is opening a dumpster. Dumpster divers only have to worry about bringing a flashlight to see what is inside and leaving the place clean after choosing their food. It is a matter of chance to find different kinds of products and also how often they want to go. The fact that dumpster diving exists in Denmark, does not mean that the country is not aware of food waste. According to Stop Waste Food, Denmark’s largest non-profit consumer movement against food waste, “in the short time the movement has existed, the discourse regarding food waste in Denmark has changed from a rather uninformed indifference to one of heightened awareness”, claims its website. Moreover, half of Danes think more about how much food they buy compared to five years ago, according to figures from the report TNS Gallup for Berlingske, 2014. Recently, stores have implemented some policies to reduce food waste too. One of them is to reduce the price of the products of which the expiry date is close. “If the expiring date is today or tomorrow we will just lower the price”, says Heilns from Fotex. In Rema 1000, one can see not only hundreds of fruits and vegetables, but also household products and even toothpaste at 50% discounts right in the entrance of the store. “We get rid of all of it easily” claims Martin, a worker of the company with certain air of pride in his face. Another option that the supermarkets chains are taking is to collect all organic waste (except bread) from all Føtex and Bilka hypermarkets and send them to a plant and convert it into biogas and compost. The bread is picked up by farmers for feeding their pigs. Furthermore, the supermarket chain Coop recently started to sell rotten or wonky carrots in their stores and also signed the Food Waste Manifesto with Stop Wasting Food movement – a pledge to reduce food waste by 10% per year in all Coop’s stores in Denmark. Food banks are showing good results as well. They are organizations that collect donated or surplus foodstuffs and distribute them free or at low cost to programs serving people in need. Three million meals based on this idea were served in the Nordic countries in 2013. All of this sounds promising. Nevertheless, Aschemann-Witzel claims that “that the Danes report to have reduced food waste does not necessarily mean food waste has considerably decreased, considered that food waste from households is still high”. There is still a long way to go. “In the short-term, dumpster diving is not a solution to food waste as such, but it is a great action in order to create awareness of the issue”, said Jessica. For Kristifier, the future of dumpster diving is that more supermarkets will lock their dumpsters and this practice will come to an end. For the rest of the actors in society, the future challenge is to find more real ways to reduce food waste.